Recently an announcement was posted on "Dandavats.com" wherein the representative of ISKCON's Sri Sri Krishna Balaram temple in Vrindavana [Shyamakrishna Das] informed all the devotees around the world that "Srila Prabhupada's Bhajan-kutir is now re-opened." Shyamakrishna Das says in his announcement that "H.G. Srestha Prabhu, Co-Temple President, ISKCON, Krishna Balaram Mandir and Nirmal Chandra Goswami, Sevayat Radha Damodar Mandir led the event." Unfortunately, Shyamakrishna Das has given quite a misleading picture of what has transpired in the courts and what transpired on the day that Srila Prabhupada's rooms were re-opened and the Deity of Srila Prabhupada re-installed and pujas resumed. First of all the interim order passed by the Hon'ble High Court at Allahabad on 12th February, 2007 gave the keys of Srila Prabhupada's rooms to Radha Damodar and stated that the rooms of Srila Prabhupada were to be open to the public and devotees from 8 am to 1 pm and again from 3 pm to 8 pm daily. The court case filed in Allahabad reads "The International Society for Krishna Consciousness Vs Thakurji Radha Damodar." As sevaites of Radha Damodar, the respected sevaite-acharya of Radha Damodar, Nirmal Chandra Goswami is the representative of Radha Damodar in the case. In compliance with the intern order from the court Nirmal Chandra Goswami is keeping Srila Prabhupada's rooms open daily from 8 am to 1 pm and from 3 pm to 8 pm. During these timings all devotees are being allowed to come for darshan of Srila Prabhupada and ISKCON devotees are being allowed to do some service, cleaning of Prabhupada's rooms and offering some bhoga to the Deity of Srila Prabhupada. However, the court order released on February 12th has not mentioned ISKCON or given them any seva privileges whatsoever. Their present ability to serve Srila Prabhupada every day at Radha Damodar is simply the open opportunity for any bona-fide devotee of Srila Prabhupada who wants to render such service. In this regard Nirmal Chandra Goswami is very co-operative and enthusiastic to see devotees come forward to serve Srila Prabhupada. In his announcement on Dandavats.com, Shyamakrishna Das apparently wants to assure the devotees that "ISKCON is in control of the situation" at Radha Damodar temple, but for whatever the reason they are not. 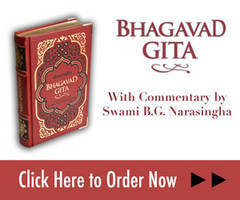 In fact, when the Deity of Prabhupada was being re-installed in his bhajan-kutir, H.G. Srestha Prabhu, Co-Temple President, ISKCON, Krishna Balaram Mandir and other ISKCON devotees were not present at all. The Deity of Srila Prabhupada was re-installed in his rooms on the morning of Siva-ratri by Swami B.G. Narasingha, Swami B.V. Tripurari and Nirmal Chandra Goswami. There were about 70 devotees from various missions present for the event, which included bathing of Nirmal Chandra's personal Deity of Srila Prabhupada, kirtan, offering the first bhoga to Srila Prabhupada in his room and arotika. But no ISKCON authority was present for the event. It may also be noted at this point that during the last months wherein representatives of both parties would appear in the Allahabad High Court, no senior disciple of Srila Prabhupada, GBC man, sannyasi, or ISKCON guru even attempted to contact Nirmal Chandra Goswami to try and work out the misunderstandings in an amicable way. Had such steps been taken, as Srila Prabhupada would always do in such situations, the outcome of this issue might have been more favorable to ISKCON. Later that day Narasingha Maharaja spoke with Srestha Prabhu about Srila Prabhupada's rooms and the bad relationship that has developed between ISKCON leaders and the Radha Damodar Goswamis. Narasingha Maharaja encouraged Srestha Prabhu to sincerely endeavor to improve the personal relationship between ISKCON and Nirmal Chandra Goswami, who has been grievously offended by the demonizing propaganda that ISKCON leaders launched against him over the past seven or eight months. Narasingha Maharaja has suggested that regardless of where this issue of Srila Prabhupada's rooms ends up in the future, ISKCON owes Nirmal Chandra Goswami and his family an earnest apology. In the meantime Srila Prabhupada is once again being happily served by devotees in his bhajan-kutir at Radha Damodar and all devotees are being heartily invited by Nirmal Chandra Goswami to visit and serve Srila Prabhupada at Radha Damodar temple.